The FORCE project (click here for details) has produced a handbook that aims to provide reef managers with tools, information and recommendations on management of coral reef ecosystems. 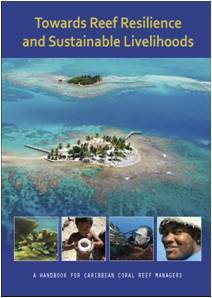 The handbook sections range from ecological history and biogeography, resilience as well as climate change issues to fisheries, governance and the monitoring of coral reef ecosystems.Within each section are practical stand-alone ‘briefs’. These briefs offer concise information on particular reef-related issues, utilising some of the most recent scientific research to inform management actions. Each of the briefings is a unique grab-and-go resource. The accessible format also provides a useful resource for students, researchers, policy-makers and anyone interested in the future of Caribbean coral reefs. Click here is you would like a higher resolution copy of the entire handbook. Be warned, this document is 292M in size.